Format: PDF of the score and parts emailed manually within 24 hours of purchase. 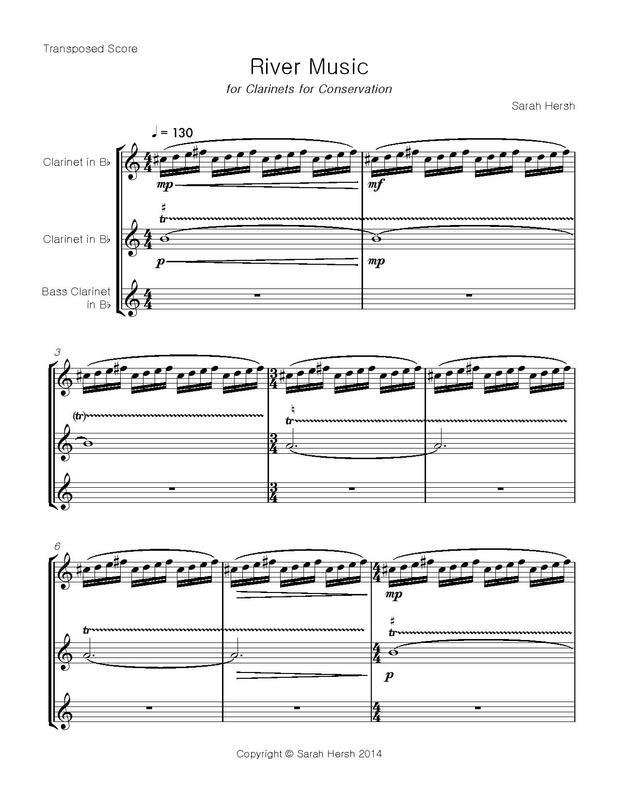 The PDF also includes a bonus set of parts that include a partial score underneath the main score. River Music was inspired by my time one summer spent on the Chattahoochee River and at the Chattahoochee Nature Center near Atlanta, Georgia. I have always had a connection to bodies of water, having spent many summers and weekends at the lake by my grandparents’ house in New York. While sometimes I feel like an outsider as a New Yorker living in the South, as soon as I got on the river, canoeing down the Chattahoochee, I felt at home again. Something about the river reminds me of my childhood on Lake Peekskill, and River Music was partially inspired by that connection. ﻿Once I started writing the piece, it took on a life of its own, as water and nature (and composing) often does. One reason I’ve always felt strongly about environmentalism and protecting our natural environment is that all of it – the trees, the earth, the rivers, the lakes – has been here long before we came along and started messing it up, and it will (hopefully) be here long after we’re gone, as long as we make sure to protect these natural spaces and wilderness areas. I often think about how much trees have seen, and as I wrote this piece I started thinking about how much the river has “seen” too. I hear stories in River Music, and to me it’s the river telling us some, though certainly nowhere near all, of its stories. ﻿Perhaps River Music will take you, the listener, on a journey down the river—not just through space, but through time. You might hear some of the same stories I hear. Or you may not. Part of the beauty of writing a piece inspired by a river is that I hope you hear in it whatever the river means to you. River Music was written for Clarinets for Conservation as part of the Wilderness Act Performance Series.